The smell of freshly baked bakarkhani infiltrated the morning chaos that besieged the tiny laneways of Puran (Old) Dhaka. The neighbourhood is dotted with dozens of hole-in-the-wall bakeries that specialise in this traditional, flaky flatbread and peering into any one of them, watching bakers bent over a hot tandoor (earthen oven), will transport you back in time, away from the cacophonous ringing of the rickshaw bells and the bedlam of dusty construction sites. Sandwiched between a shop selling glittery kurtas and the crush of people, I craned my neck to catch a glimpse of the familiar shock of white hair belonging to Taimur Islam, our lead guide. Islam, founder of the Urban Study Group (USG) was taking me around Puran Dhaka, tracing its history over the past 400 years to include the British Raj, Mughals and Afghan traders. “It is a city with a Mughal skeleton, but Colonial flesh,” says Islam sagely, the signs of which are still intact in the many old buildings scattered amongst the concrete jungle that now exists in its stead. 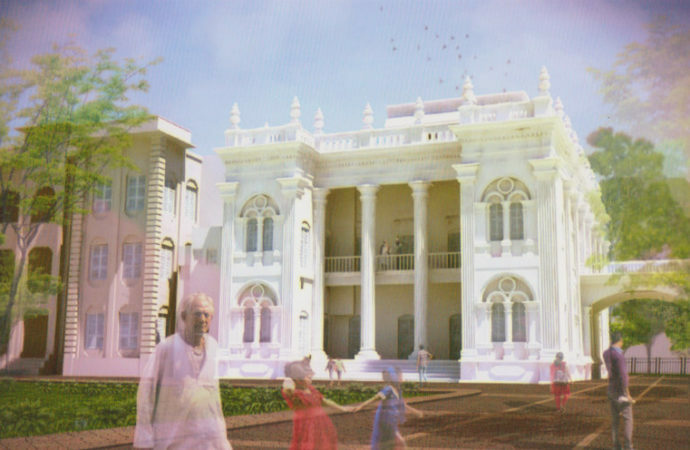 The Group has been campaigning for the preservation of heritage buildings since 2004. The laneways of Puran Dhaka, by virtue of existing for centuries, have witnessed their fair share of disasters. However, in 2004, a deadly multi-storey building collapse in Shakhari Bazaar killing nineteen people propelled it into the limelight, instigating heated debates about the future of the oldest part of nation’s capital. Citing congestion, unplanned and unsafe structures, critics called for the mass demolition of all dilapidated buildings. A technical committee was formed, which, after hurried sidewalk surveys, earmarked around 800 structures to be torn down. Conservationists rallied, advocating for the protection and restoration of all structures of historic and cultural relevance. Islam, an architect, has an innate appreciation for the history and cultural heritage that ancient architecture affords. He also has deep ties to the area, developed while a student of architecture. As a student he dedicated a significant chunk of his time in studying the unique attributes of Shakhari Bazaar, the oldest surviving mohalla (traditional neighbourhood) in Dhaka, dating back to the pre-Mughal era. For centuries, Shakhari Bazaar has been home to traditional artisans, the Shakharis, renowned for making conch shell bangles and other religious artefacts. The narrow and congested road, houses several buildings whose foundations date back to the Mughal and Colonial eras, their intricate facades defying the melee of dirt and disrepair to lend a unique charm to the neighbourhood. Alarmed at the prospect of losing an integral part of Dhaka’s history, Islam, along with other concerned members of the community, formed the “Save Shakhari Bazaar” campaign, focusing their efforts to create awareness amongst media and donor agencies in an attempt to stop the demolition of historic buildings. Islam and his fellow campaigners began to invite members of the civil society and the expatriate community to join them for educational walks around Puran Dhaka to learn more about these buildings, many in various stages of disrepair, and their significance in Dhaka’s rich, cultural past. Their small group soon expanded to include members of the local community and thus began Urban Study Group. A mere two years since its inception, the Group’s dedication came to fruition. The Urban Study Group is a voluntary organisation and its campaigns are primarily self-financed. 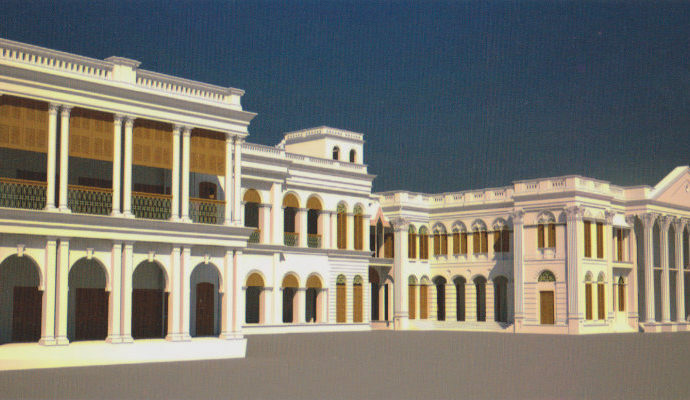 In 2006, the Group received a small grant from UNESCO for the restoration of notable buildings in Puran Dhaka. However, intensive repairs were required, and the delicate task of rebuilding would require teams of craftsmen whose arts were all but lost. The Group and UNESCO changed tact and decided to focus more intensively on raising awareness. 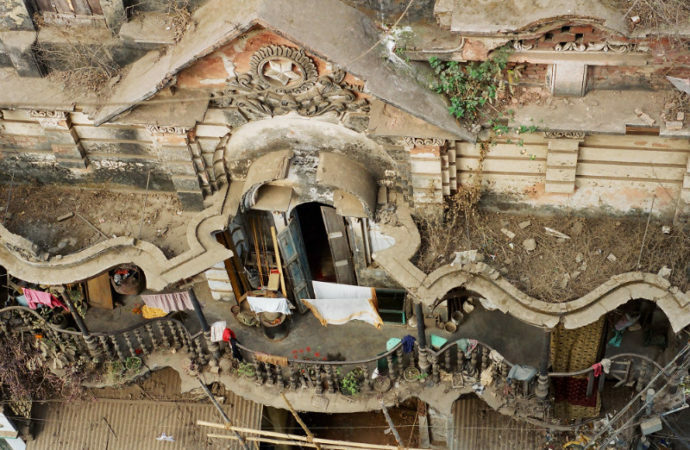 They hosted an exhibition titled “Save Shakhari Bazaar” using photographs to map the area and superimposing notable buildings upon the more recent developments, allowing viewers to get a sense of the scale of the issue at hand. Over the next few years, Islam and his team persisted with their campaigns, speaking with government bodies, at seminars and even took their drive overseas, speaking to officials at the Getty Conservation Centre and other agencies. While all parties are swift to acknowledge the need for conservation and are appreciative of the Group’s work, however, the fact remains, that for a developing country like Bangladesh, funding needs to be allocated for more immediate challenges and heritage conservation features further down on the list of priorities. When asked what the campaigns greatest challenges were, Islam said, “The issues can be summarised by three D’s” and he went on to explain further that the three D’s included disaster management – once a building has issued a dilapidated structure certificate, the authorities are quick to demolish it, with little time available to review whether the verdict; detailed area plan – road widening and urbanisation policy planning does not take heritage or historic value into account; and finally, developers – urban development and community sentiment currently caters to developers with little consideration for heritage conservation. “Urban planning in Dhaka has been spontaneous,” Islam adds, ruefully acknowledging building regulation codes are regularly flouted and that lack of coordination between different government jurisdictions create more opportunities for loopholes. In trying to contain the city’s urban sprawl, policymakers have had to compromise on heritage protection. One of the reasons behind the disparity between the lists is because USG focuses on entiremohallas or neighbourhoods, not just individual structures. The mohallas make up the of backbone of Puran Dhaka. Each neighbourhood houses different communities, traditionally based on their craft or profession. They act as windows into the past – the tiny shops lining the ground floor of century old structures, hawking the same wares for generations; the decrepit but carefully crafted veneers of ancient structures, and the crush of people going about their business, pretty much in the same manner as a century ago. “Unless these areas are preserved in its entirety, the city will face irreparable damage,” Islam exclaims. 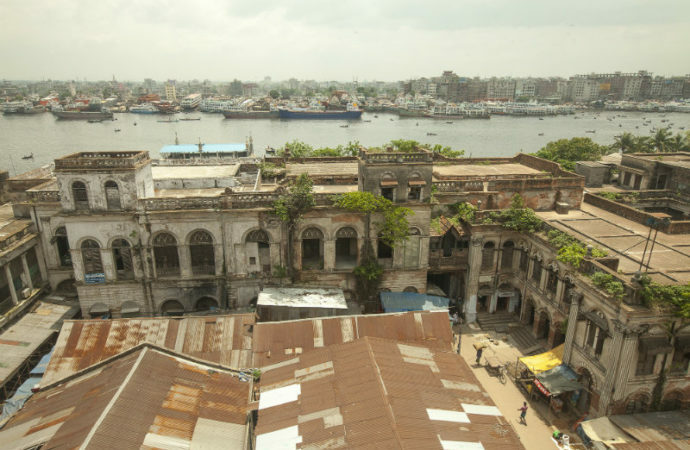 There are close to 50 distinct neighbourhoods in Puran Dhaka and just by targeting these pockets of history, USG have pinpointed 1,500 buildings requiring conservation. I found myself clambering through a warren of narrow, musty passages and down a set of steep, stone steps, worn smooth with age. Tiny slits in the stonework emanated shafts of light, barely illuminating my path. I blindly followed the USG volunteer guiding me out of the remnants of current day Boro Katra – a Mughal caravanserai built in 1646 and a popular pit stop for weary travellers on the fabled Silk Route. As I exited the structure, taking in the original wooden beams that had managed to survive, I realised that the city had grown around the old walls of the caravanserai. Tiny stationary shops and dank printing presses had mushroomed out under the Mughal building and around the wall, borrowing the ancient beams as their own shop structure. Noticing my scrutiny, a USG volunteer pointed towards the mouldering caravanserai gates, and said, “This is the Southern gatehouse. One of the old city gates. It used to dominate the city skyline. Now, you can barely see it because of the multi-storied buildings around it.” Truly, the intricately carved ceiling, still awe inspiring, now appears to have been enveloped by the concrete structures that have been built around it. I looked to see where my guide was pointing and noticed a set of aluminium window frames jutting out of a neighbouring apartment building, barely six inches away from the ancient walls. 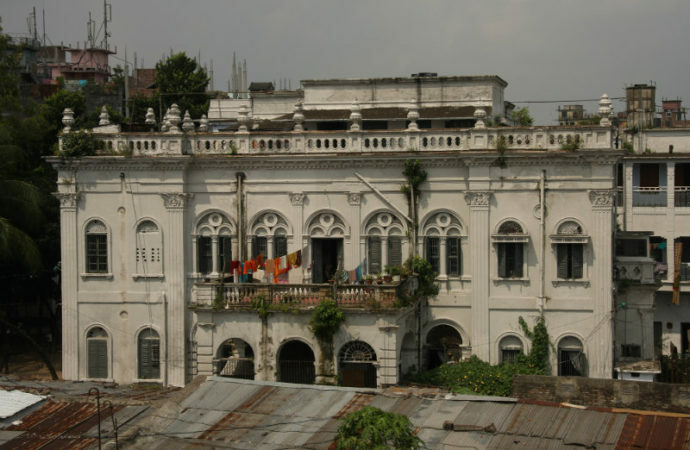 Islam concedes that many of the buildings that feature on their Puran Dhaka walks are protected including Boro Katra. “At least on paper,” he adds, but the current state of these structures remains deplorable. Some notable buildings, like Boro Bari in BK Das Road, had even lost their protected status. The Group’s campaigns have begun to gain recognition and in 2009 it received the American Ambassadors Fund for Cultural Preservation for the restoration of a building in Shakhari Bazaar. This year, it has also received a small grant to restore Armanitola School, the first primary school teacher’s training school in Dhaka. However, the Group’s biggest achievement, as Islam suggests, has been the creation of the comprehensive heritage list. Undertaking extensive surveys and documenting all the heritage buildings is a significant body of work, particularly as there are no other records that are as exhaustive. Islam also notes the rising awareness amongst society and humbly suggests that USG can only take partial credit for it. 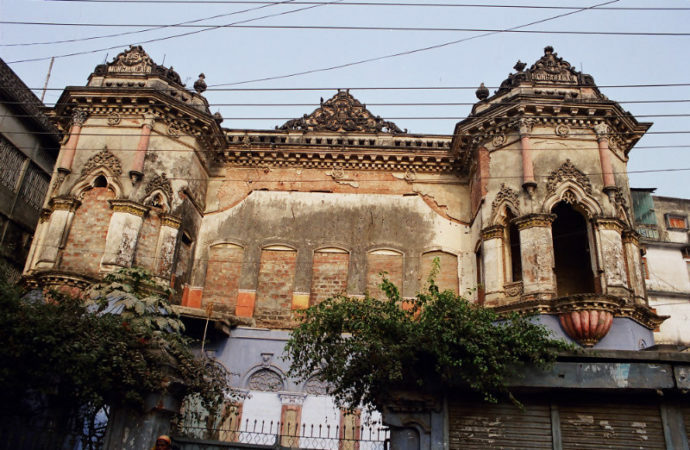 He highlighted the growing popularity of Puran Dhaka’s architecture amongst pop culture, saying, “Mainstream media frequently uses Puran Dhaka as a backdrop for their serials and photoshoots.” People have slowly begun to appreciate the beauty of the antique facades in all their dilapidated glory. While walking around Puran Dhaka with Islam and his team of volunteers, it occurred to me that perhaps, the Group’s biggest success was the way they have chosen to approach conservation and heritage, instilling in the local youth an appreciation for history and igniting a passion to protect it, creating a new generation of conservation champions in the process. Our Puran Dhaka walk had started at Hussaini Dalan, under the shadows of the 17th century Shia mosque. After the briefest of formalities, he invited one of his volunteers, Akash, to step forward, who stood before an assembly of ambassadors and media personnel, speaking articulately about the history and cultural importance of the site. Akash was a college student who had grown up in the area and wanted others to appreciate Dhaka’s rich, cultural past as much as he did. I noticed Islam gently encouraging a meek, young girl to speak up. A high school student, it was her first-time volunteering as a guide, and it took her a couple of attempts to beat her nervousness and project her voice, but under Islam’s tempered tutelage, she flourished, her ardent voice rising as she educated us with facts and dates. As I toured the laneways, hopping from one crumbling historic gem to the next, I was joined by a succession of young volunteers, all locals, and all students or young professionals, bound by a common cause – their love for their heritage and culture. Some had heard of USG through friends, while others had seen Islam and his campaigners taking people around historical sites, advocating passionately for their conservation. Their loyalty, and willingness to give up precious weekends, is testament to Islam and USG’s hard work. In their attempt to conserve a part of history, USG have managed to protect the future by cultivating a new breed of conservationists. Islam draws on inspiration from other historic cities and shows me stunning streetscapes from the Shanghai waterfront, the Bombay Old Town Heritage Precinct and Singapore’s Chinatown – all tourist hubs. Islam firmly believes that with proper planning, it will be possible to protect both heritage and development and promote tourism. However, the first step would be to identify historic areas being incorporated into the blueprint of new landscape. As an immediate call to action, he recommends temporarily ceasing all demolition of old buildings over the next 6 months for USG and other authoritative bodies to take stock of the heritage buildings we already have. Actions should then be taken by responsible authorities to preserve and restore these structures.